Home / Blog / Building a home even your pets will love. When you build a stunning new home, you’re probably most excited about the design and features you want to create the lifestyle you love. So you’ll be forgiven for overlooking another great love who may share your new home – your pets. So take a moment to consider how to make your home a happy and safe place for your four-legged friends. The good news is that our new home designers have done it all before, so they can help you. Here’s a handy list of their top tips to keep tails wagging and engines purring. First things first! 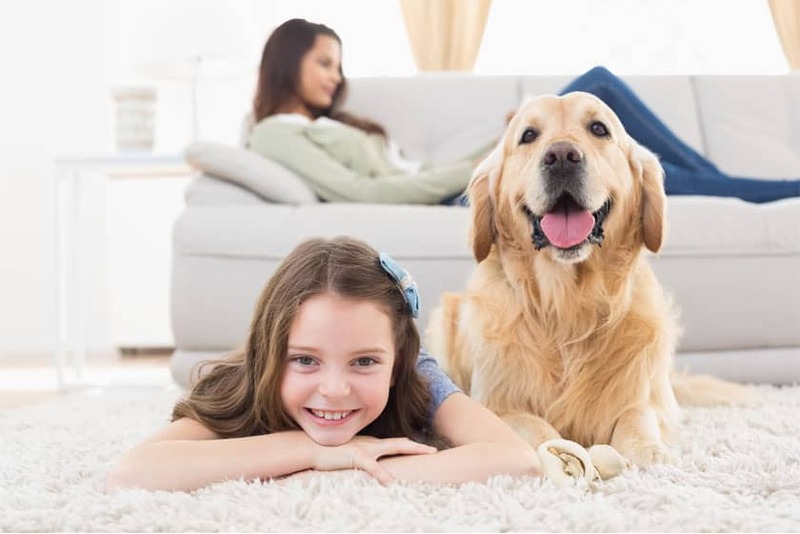 Giving your pet an easy way to get in and out of your home along with a place to wash off will keep everyone happy and your home free of muddy paws. Pet doors come in all shapes and sizes, and they can be installed into windows, sliding doors and standard doors, ensuring your fur-babies have the freedom to come and go safely – whatever their size. If you get out and about often with your pets, think about an alternative entry into your house. This can give you the space to wash and dry off your dog after a muddy run, a sandy beach swim, or a session rolling around in funky stuff you wish they’d avoided. Pets are naturally curious, so make sure can stay safe and out of danger. You may also want to install a recessed pet gate in the kitchen to avoid accidents or near an entrance if they get a little too excited when greeting you. These slide out from the wall and tuck back in when you don’t need them. Other ways to prevent your pets being hurt, include avoiding harmful plants, furniture that can topple over, and don’t forget a special lid for your toilet! Remove as many breakable and fragile objects from floor and jumping height. We all love that doggy excitement, and it’s even more special when nothing gets broken or damaged – especially your precious pet. We all need a space of our own, and your pets are no different. Create designated spaces, inside and out, where your cat or dog can feel free to play, scratch, roll or jump. Ensure they’re not in any danger, and add their own furniture and toys. For cats, a stylish scratching and climbing pole is fun, plus it saves your furniture. And keep toys in a storage area close by so you can put them away if guests arrive. Similarly, allocate space in your kitchen for their food and treats. Pets like the familiarity and it helps contain any mess. Some cabinets have built-in ‘feeding benches’ with recessed areas for food and water bowls, as well as storage compartments for their other pet goodies. Who doesn’t adore pets wanting to snuggle up next to them? We all love a good cuddle from time to time but it’s a good idea to give them their own place to relax and stretch out. Luckily, there’s a whole world of designer pet furniture these days, so everyone has their own special place to get comfy on their own. Better still, colour co-ordinate pet furniture with your room décor, creating a seamless style with a range of pillows, doonas, beds, and rugs you and they will love. Our pets help make our lives and homes complete, but they can also add a bit of wear and tear. No need to worry! There are materials you can choose to keep everything as pristine as the day you move in. If you have pets that are prone to crewing or scratching, try choosing furniture with metal legs and bases. Black steel, copper and brass are very on trend right now. This will allow you to still have those chic looking pieces without having to worry about them being damaged. Leather couches are another great hard-wearing, stain resistant option. Another good idea is to keep carpeting to areas like bedrooms that you can close off from your pets. But for areas where your pets will frequent, you’re going to need something more durable. Go for hard and lasting flooring. Pick surfaces like ceramic tiles, slate and hardwood flooring that are resistant to scratching and denting. Not only will they be great for your pets, they will add beauty to your home for years to come. Our home designs offer a range of excellent quality flooring choices that are durable and easy to clean and maintain. Something that often goes overlooked but is a major part of your home that can get easily damaged – the walls! Keep in mind surface texture. When pets rub up against a textured wall surface, including wallpaper, it attracts pet hair and marks. To keep things low maintenance, your best bet is to go for an easy to clean satin or a semi-gloss paint. Take a look at the full list of our Ultimate Inclusions that can be added to your new home easily and transparently. Then go ahead and enjoy your pets, and real lasting value in a beautiful home. Visit one of our many display homes for design inspiration or talk to our team about building a new home today for you and the entire family. Previous article 5 simple ways to create a cosy winter home. Next article Home inclusions: are they worth it?